Weather is one of the most important factors in grape production as well as being one of the most difficult to manipulate or control. While a vineyardist has little control over the weather, keeping tabs on some basic weather parameters such as temperature and precipitation can pay big dividends by allowing more informed decision making in the vineyard. Weather is an important factor from the initial site preparation to aiding in the decision of when to harvest. While weather information is easily found from any number of sources on the internet these days, the most useful weather data comes from a weather station located in your vineyard. The type of weather instrumentation will vary according to the type of information you are planning on using and will run the range from a high/low thermometer and plastic rain gauge to an electronic data logger. Having an idea of how you will use weather information will help you decide what type of equipment you should invest in. Following are some of the uses of weather data. Typically you will have a site before any weather instrumentation is able to be installed. However, before a vine is planted in the ground it is extremely useful to have an idea of where the warm and cold spots are in particular vineyard blocks. The costs of temperature data loggers have come down dramatically providing growers low cost tools to create a grid of data loggers across the vineyard. Running the temperature data loggers over at least one winter will provide the information need to create an isotherm map of the vineyard. Increasing the number of data loggers per site as well as collecting the information over a number of years (both growing and dormant seasons) will increase the usefulness of the information. Determining warm and cold spots within a vineyard will assist in the determining where cold-tender varieties are best suited. See also the article on site selection. An index that relates the development of plants, insects, and disease organisms to environmental air temperature. To calculate GDD Growing all you need is a method of measuring the high and low temperature each day. Growing degree days are used in the comparison of growing seasons to each other and to the average, to assist in the timing of some production practices and to provide guidance in the timing of insecticide applications. 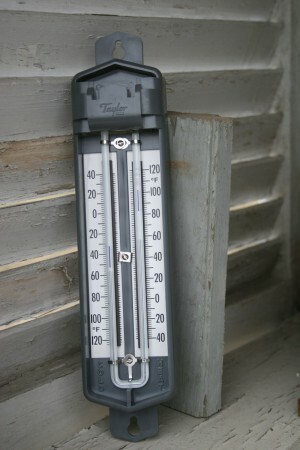 Growing degree days can be tracked using a high/low thermometer that is checked on a daily basis. Temperature, precipitation, relative humidity and leaf wetness are needed in different combinations to determine if conditions are favorable for the infection to occur by the diseases; Powdery mildew, Downy mildew, Black rot and Phomopsis. More information on diseases and the powdery mildew and black rot models used to determine infection periods in the NY and PA Pest Management Guidelines for Grapes. Determination of infection periods for the major diseases of grapes can be automated by using a data logger style of weather instrumentation (see below) that is downloaded and run through computer programs designed for this specific use. The Network for Environment and Weather Applications (Link to NEWA) makes these forecasts available for sites within New York State and some surrounding areas. Precipitation and evapotranspiration will give you a good idea of how much water has been added to the vineyard system and how much has been lost. To determine evapotranspiration a data logger type of weather equipment will be necessary. These thermometers must be read and reset on a daily basis to be valuable in the determination of growing degree-days and the results recorded in a database to be useful from year to year. 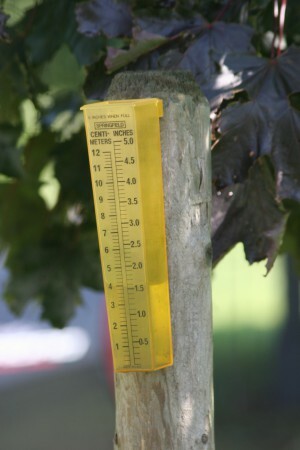 Rain gauges can be purchased at any farm supply store, hardware store or big box store. You will pay for precision with rain gauges, the more you spend the better the accuracy. Plastic rain gauge for end post in vineyard. Data loggers are made to record and store weather information from a single parameter (typically temperature), to multiple parameters (temperature, leaf wetness and relative humidity) to weather stations that collect weather data from the standards of temperature and rainfall to wind speed and solar radiation. Data loggers which just record temperature are relatively inexpensive and have the ability to store information for a growing season or over winter. Electronic weather stations are available that allow connection to a computer via Radio Frequency to provide real time weather information as well as a convenient method for collecting and storing weather information. You can quickly set up weather collection sites in any number of vineyard blocks with a high/low thermometer and rain gauge. While this type of weather site is inexpensive to purchase, it does require the investment of time. The critical step for success with this type of station is to get into the habit, or make it someone's job, to visit each site at approximately the same time each day to record the information. Before you purchase a full weather station, investigate whether or not your state, region or local industry has a weather network. Many states and/or universities have developed organizations that combine publicly- and privately-owned weather stations into a network that collects, compiles and then displays weather information on the web. In New York the NYS IPM Program operates the Network for Environmental & Weather Applications (NEWA). The benefits of belonging to a weather network typically come from the network doing the heavy lifting with data crunching to determine things like infection periods and growing degree days. It is then a simple matter of accessing the web site and viewing the information for your specific weather instrument. Contact the network in your area before making any purchasing decisions to ensure that the network will be able to access your weather station. 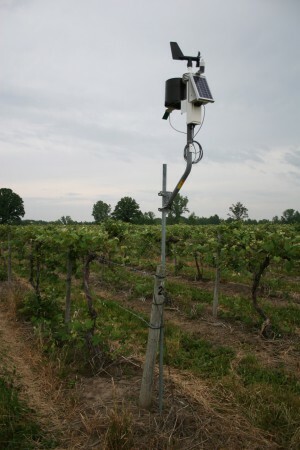 RainWise weather instruments should be placed in vineyards at strategic locations.